You want to enjoy your day out fully, but not all day guided. No problem. We can start in the morning, a ½ day guided trip with sightseeing and introduction to Dutch history and heritage. The tour can end on a beach, or in a town or place you want to visit on your own. We part there, but I leave directions for the way back with you. For thematic suggestions for day trips just outside Amsterdam click here. 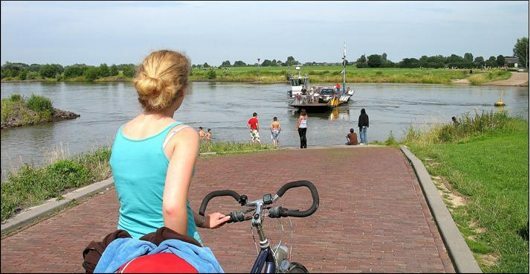 The Netherlands are also ideal for longer bicycle vacations. And even in high season, there is no reason really why you wouldn't adventure on your own. Yes, popular beach resorts will be crowded, and Amsterdam. But simply avoid cycling there. For visiting Amsterdam or other larger cities, a short train ride from a nearby smaller town will do the job. When you intend to go on a self guided trip, discussing your plans with an experienced local will obviously make a difference. Best thing to do is having a half day bike trip together, to get you on the road. An introduction to local traffic rules and habits, general background information on the country, and of course, to talk about your plans and interests. If needed, we can work out route and logistics for your plans after the bike tour, put your personalized program on paper for you to take along. Rates and conditions are simply that of a half day bike trip, or possibly time charged by the hour. For more information on these unique possibilities, send an e-mail.